This book was written by Danish author Peter Høeg and was first published in 1992 in Danish and in 1993 in English. It is a dense and complicated story with beautiful imagery. Throughout the story the reader is learning about snow, ice, weather, geology, Greenlanders and much more. The protagonist of the story is Smilla Jaspersen, a woman of 37 who spent her childhood in Greenland with a Greenlandic mother and a Danish father. Her mother is a hunter who is portrayed as being as strong as a man. Smilla idolises her. Her parents divorce after a few years of marriage and her father goes back to Denmark. When her mother dies in an accident, Smilla is forced to go and live in Denmark with her wealthy father. She misses Greenland and her mother terribly and hates the supercilious attitude that the Danes show to Greenlanders. She runs away from home repeatedly trying to return to Greenland but is always brought back. She grows up resenting her father but remains reliant on him for money. The story opens in Copenhagen with the death of Isaiah, a young Greenlandic boy who has a drunk for a mother, and who lives in the same apartment block as Smilla. The unlikely friendship between loner Smilla and taciturn Isaiah is brought about by their shared love for Greenland and their mutual understanding of the need for space and silence. Smilla doesn’t particularly like children but she sees in Isaiah a kindred spirit. His mother is drunk most of the time and doesn’t look after him properly. Smilla offers him food when he is hungry and reads to him from her favourite book, Euclid’s Elements. There is another inhabitant of the apartment block who spends time with Isaiah – the Mechanic. Isaiah goes and silently works alongside him, not helping him but working with his own stuff. When Isaiah dies, the police close the case as an accidental death. Smilla thinks differently and believes that Isaiah was being chased when he fell off the roof of the building. Smilla starts to investigate the case on her own, and later with the mechanic. Smilla has all sorts of violent encounters while she is investigating Isaiah’s death and she nearly dies a couple of times. She feels she owes it to Isaiah to find out what happened to him and why he died. She overcomes some of her own phobias in order to get to the truth. She is inherently mistrustful of people but lets her guard down with the mechanic and develops strong feelings towards him. There are some interesting themes running through the book – colonialism, alienation,fanaticism. 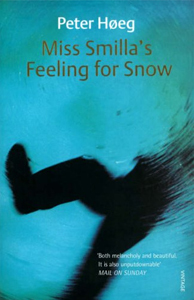 There are also different translations of the book running around and the title of the book changes from Miss Smilla’s feeling for snow to Smilla’s sense of snow. The story lends itself to a cinematic portrayal and in fact a movie has been made. 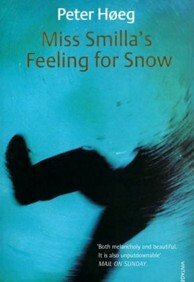 Peter Høeg writes beautifully and the reader is transported into scenes of snow and ice and freezing temperatures. Høeg spent time as a sailor and his descriptions of the ship and life at sea are detailed and authentic. The tension is maintained throughout the story but there is no stunning denouement at the end – rather a trailing off that leaves the reader with many unanswered questions. But a good read, nonetheless.